A special constable or special police constable (SC or SPC) is generally an auxiliary or part-time law enforcement officer. Many police departments are complemented by a Special Constabulary which are referred to as special constables or informally as "specials". Special constables hold full police powers and hold the office of constable. Historically, and in different contexts, special constables have been paid or volunteer members of an ad hoc reserve force or a permanent auxiliary, and have ranged from unarmed patrols to armed paramilitaries. In the Australian state of New South Wales, Special Constables may be appointed by a Magistrate or two Justices of the Peace where "tumult, riot, or serious indictable offence has taken place, or may be reasonably apprehended" and the Magistrate or Justices believe that "the ordinary Constables or officers appointed for preserving the peace are not sufficient for the preservation of the peace, and for the protection of the inhabitants and the security of their property, or for the apprehension of offenders". Special Constables, as appointed under the Police (Special Provisions) Act 1901, have the same powers as Constables of the New South Wales Police Force. Similar provisions apply in other Australian states. Inspectors of the Royal Society for the Prevention of Cruelty to Animals are generally appointed as Special Constables. Members of police bands are also appointed as Special Constables. State police stationed near their state borders are sometimes assigned the status of Special Constable in the neighbouring state to allow hot pursuit of offenders across state borders and lawful arrest on the other side. Special Constables are also employed by various local government agencies in New South Wales including the RSPCA (Australia Royal Society for the Prevention of Cruelty to Animals), local councils, RailCorp and NSW Health to enforce such laws such as cruelty to animals, parking, enforce railway laws and prevent disorder in certain circumstances. The NSW Police Force employs Special Constables as an armed internal security force. This special internal unit provides protective services to government departments such as the Premier's Office, the Independent Commission Against Corruption (ICAC), the Governor of New South Wales and the Director of Public Prosecutions (DPP). They also protect covert police locations and have a mobile rapid deployment team (MIST – Major Incident Security Team) with advanced firearms and defensive tactics training, for special assignments. Special Constables were used extensively in Canada prior to the Second World War to quell labour unrest. After the war, industrial relations became far less militant and many of the larger urban police forces created permanent auxiliary units. Special constables of the British Columbia Provincial Police during the 1935 waterfront strike. The most notorious use of Special Constables in Canadian history was during the Winnipeg General Strike of 1919. The entire Winnipeg police force was dismissed because its members refused to sign an anti-union pledge and was replaced by a much larger and better paid force of untrained Special Constables explicitly to end the strike and the police union. Today, in Canada, the term 'Special Constable' does not signify a police volunteer. Instead, they are sworn-in and employed by Police Services, law enforcement agencies or the provincial ministry responsible for law enforcement to undertake specific duties many of which require the powers of a police officer, such as explosive disposal technicians, court security, campus security or executive protection for diplomats. Depending on the department some are members of a Special Constable Service as University, Housing, and Transit Constables. Special Constables for Federal Agencies are typically investigators for the Competition Bureau and Canadian Food Inspection Agency. Special Constable appointment is not a replacement for a police officer. The appointment confers limited authority and the jurisdictional police will still have overall law enforcement authority and responsibility regardless of the Special Constable. For example, on a university campus or a transit system, Special Constables may deal with crimes, however the local police will have the overall responsibility for Criminal Code enforcement. Special Constables in Ontario employed by Police Services, such as court security officers, prisoner transport officers, cell block officers and snowmobile trail patrol officers, are sworn-in pursuant to section 53 of the Police Services Act which confers peace officer status. Special Constables have the powers of a police officer to enforce Federal Statutes and various Provincial Statutes while in the execution of their specifically appointed duties throughout Ontario. Special Constables are also utilized at many Ontario universities to provide a hybrid police-security service to their respective communities. Service vehicle for the Transit Enforcement Unit, an authorized special constable service of the Toronto Police Services Board. 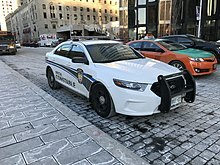 In Ontario, Special Constables are generally not armed with firearms, the exception being the Niagara Parks Police Service and the Legislative Assembly of Ontario Special Constables. At times, provinces may need to swear in a visiting police service to allow peace officer status. This is frequent with RCMP in Ontario as well as Sûreté du Québec in Quebec. Cross jurisdictional issues can be alleviated with special constable appointments. The government may also appoint Special Constables, who only need the authority to serve summons and subpoenas, etc. In the province of British Columbia, for example members of the Conservation Officer Service are designated Special Constables under that province's Police Act, and are responsible for enforcing specific provincial and federal laws, including certain Criminal Code offences. Other BC Special Provincial Constables for approximately 25 other Provincial Agencies and Crown Corporations duties vary from Criminal Investigations (Fraud, Forgery, False Pretences, Identity Theft/Fraud) to Regulatory Investigations, Intelligence Gathering and Protective Services. Typical roles are Fraud Investigators (Benefits/Claims Fraud and Identity Fraud for ICBC, WorkSafeBC, Income Assistance, Childcare and Healthcare); Compliance and Enforcement Investigations regarding, Consumer Protection, Film Classification, Financial Institutions, Securities/Markets, Gaming Enforcement, Liquor, Tobacco Tax, General Revenue, Natural Resource Officer Operations, Intersection Safety Cameras, Security Programs, and SPCA; Protection and Risk Services for the Legislature, Government and Courts. The Independent Investigations Office of British Columbia has entered into a Memorandum of Understanding with all of the agencies which use Special Constables across British Columbia. Volunteers with provincial and municipal police departments in Canada are called Reserve or Auxiliary Constables. Hong Kong Police Force and the Hong Kong Auxiliary Police Force are the only two police forces in Hong Kong during peacetime. However, the Chief Executive of Hong Kong can, pursuant to Hong Kong Laws Chapter 245 (Public Order Ordinance), section 40, appoint Special Constables at any time, who will possess any powers given to regular police officers and are subject to the same Code of Conduct. However, under section 41 (subsection 3) of the same ordinance, Special Constables are not entitled to pay, benefits, or pensions. The Garda Síochána Reserve is the reserve section of the Garda Síochána – the police force of the Republic of Ireland. It was created in 2006 to supplement the work of the permanent Garda force, and assist in performing its functions. A Garda reserve has most of the powers of a permanent Garda, but must accompany a permanent Garda on duty. A Garda reserve gets allowance after 208 hours worked. Since 1975, National service conscripts in Singapore have been used as Special Constables as part of the Singapore Police Force in addition to their role in the Singapore Armed Forces and Singapore Civil Defence Force. These Special Constables undergo training at the Home Team Academy where they study police protocol and the penal code. After training, they are posted to various specialised police departments, where they may undergo further training. Civilians who contribute to the force on a voluntary basis belong to an organisation known as the Volunteer Special Constabulary, which is a department in the Singapore Police Force. The term 'Special Constable' used to refer to any constable not sworn into a territorial police force as a regular constable. There have been examples in history of paid Special Constables who were not volunteer police officers. The United Kingdom Atomic Energy Authority Constabulary were sworn in as special constables under the Special Constables Act 1923. However, the passage of the Energy Act 2004 created a new police force – the Civil Nuclear Constabulary – with specifically defined powers and the officers lost their status as Special Constables. The Yeomen Warders of the Tower of London were first sworn in as Special Constables in the 1960s, but this stopped in 1991. There are still a few paid Special Constables – Port Police are sworn in under Section 79 of the Harbours, Docks, and Piers Clauses Act 1847 and the Epping Forest Keepers are also sworn in as Special Constables for both the Metropolitan and Essex police districts under the Epping Forest Act 1878. English Special Constables have manifested as various legal entities since 1673, but the modern-day Special Constabulary traces its roots to the 1831 “Act for amending the laws relative to the appointment of special constables, and for the better preservation of the Police,” which was passed as a response to industrial violence. The role of Special Constables was redefined into its present incarnation during the First World War when a large force was recruited both to compensate for the loss of regular members who joined the war effort and to add an extra layer of protection during wartime. Special Constables were also an important component of the state’s response to the British police strikes in 1918 and 1919 and the UK General Strike of 1926. Special Constables have all the legal powers of their regular counterparts both on and off duty and, as of 1 April 2007, can use their powers throughout England and Wales. Prior to this date, Special Constables' powers only applied within the areas of their own and neighbouring forces. Special Constables are awarded the Queen's Medal for Long Service on the completion of nine years' service with a minimum of fifty tours of duty each year. A bar is added to the medal for each subsequent ten years of service. Unlike colleagues in Scotland, Special Constables in England & Wales are not eligible for the award of the Queen's Police Medal (QPM). Special Constables are generally unpaid, but may receive reimbursement for mileage and other expenses incurred. However, some forces have implemented a bounty or allowance in order to attract and retain Special Constables. Special Constables may already be employees of a police force as support staff. This is generally encouraged as it brings a mutual benefit to both roles. In some forces, civilian staff that are also Specials are entitled to Special Leave, which allows a day off per month to undertake a special duty. Special Constables are not currently permitted to be members of the Police Federation of England and Wales. A Special Constable can join The Association of Special Constabulary Officers, which became a registered charity in 2018 to support volunteer police officers (Association of Special Constabulary Officers), formerly The Association of Special Constabulary Chief Officers. In 2017, the Institute for Public Safety and Criminal Justice conducted a representation survey on behalf of the Home Office. Results of this survey are currently under review. In Northern Ireland, the Royal Ulster Constabulary GC (RUC) employed both full-time and part-time Reserve Constables, the difference being that in addition to carrying out the same duties as the regular force, a number of full-time Reserve officers were deployed to carry out static security duty at the homes of VIPs and at vulnerable buildings and police stations. Part-time Reserve Constables carried out similar duties to their Special Constabulary counterparts elsewhere in the UK; however, like the full-time Reserve, many part-timers also carried out a more security-based role. With the assimilation of the RUC into the Police Service of Northern Ireland (PSNI), 171 part-time Constables were appointed in Banbridge, Newtownabbey, Coleraine and Lisburn District Command Units (DCUs). Existing part-time Reserve Constables were offered training to meet new standards of the PSNI. Unlike their counterparts in Great Britain, part-time Constables, like their predecessors in the RUC and PSNI Reserve, are paid. The Ulster Special Constabulary (see Ireland below) continued to exist until 1970, when its members were assimilated into the RUC as Auxiliary Constables or the Ulster Defence Regiment. The Ministry of Defence employs Civilian Security Officers for its Northern Ireland Security Guard Service; these have Special Constable Status. The NIGS is an unionised, non-industrial civilian Armed Guard Service under the authority of the General Officer Commanding (Northern Ireland), who holds ultimate responsibility for the operation of the organisation. A Civilian Security Officer (CSO) is attested by a resident magistrate as a Special Constable whilst on duty within MoD property. They hold similar powers to that of a Police Constable based on the Emergency Laws (Miscellaneous Provisions) Act 1947. A CSO has the powers of arrest under the Police and Criminal Evidence (Northern Ireland) Order 1989 (PACE). Special Constables in Scotland were defined as "Members of a Police Force" under terms of the Police (Scotland) Act 1967 and in the subsequent Police & Fire Reform (Scotland) Act 2012. They have identical powers to regular (full-time) constables. By default, they are non-contributing members of the Scottish Police Federation, which is the staff association established by statute for police officers in Scotland from the rank of Constable up to and including that of Chief Inspector, because police officers are forbidden by law to be members of a trade union. Special Constables can elect to pay a monthly membership subscription to the Federation in order to provide them with the same membership rights and protections as regular officers. Membership of the Association of Special Constabulary Officers is also open to all warranted Special Constables in Police Scotland. Special Constables receive some travel expenses and allowances from the police service, plus a £1100 "recognition award" for all officers completing the required 180 hours of service every year. There is a half-year award scheme which offers £500 at the end of the financial year for completing 90 hours. This is mainly for the benefit of Special Constables sworn in part way through the financial year; Special Constables who were sworn in after the start of the 180-hour recognition award scheme cannot opt for the 180-hour scheme. Their work is otherwise voluntary and unpaid. Most Scottish Special Constables work alongside regular Constables, and their uniform is the same except that their 4-digit shoulder number begins with "7". Special Constables do not have a separate administrative/rank/grade structure. Daily supervision is carried out in line with regular team sergeants/inspectors, and strategic management and training is provided by the Divisional Training Department and a dedicated National Liaison Officer (Inspector). Special Constables in Scotland can be deployed in a wide range of police duties over and above standard "beat duties". These include Roads Policing, Public Order, Specialist Response, Wildlife Crime and Community Support. Their primary focus, however, remains to provide a highly visible police presence, and a link with local communities across Scotland. The Royal Irish Constabulary began recruiting special constables in the 1920s, largely as a reaction to the Irish Republican Army (IRA). In the south and west of Ireland were the Black and Tans, officially the Royal Irish Constabulary Special Reserve, and the Auxiliary Division. The Ulster Special Constabulary (USC) operated in the northeast and were the main bulwark against IRA activity. The USC was divided into three armed sections: A Specials (full-time and paid); B Specials (part-time and paid an allowance); and C Specials (unpaid and non-uniformed reservists). ^ "About Us - NSW Police Online". ^ "Memorandum of Understanding Respecting Investigations", February 18, 2014. ^ "Police and Fire Reform (Scotland) Act 2012". ^ "The burning of Cork, December 1920: the fire service response". History Ireland, November/December 2015 issue.